As part of our series of white papers tracking clinical trials activity around the world, GlobalData recently compiled a summary of clinical trial in Australia. GlobalData captured records of 3,199 clinical trials across all diseases and phases that had a start date January 01, 2012, and December 31, 2016. The largest number of global clinical trials overall took place in non-small cell lung cancer, with 122 trials, followed by type 2 diabetes, hepatitis C, solid tumour, and breast cancer. 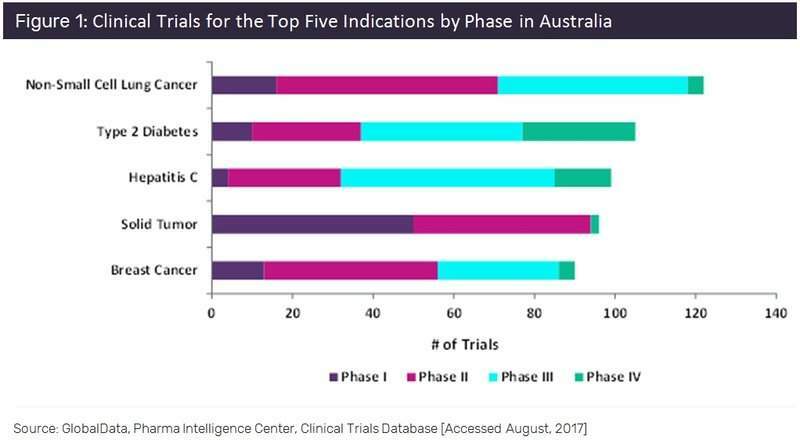 Phase II was the most frequent phase across the major indications, as shown in Figure 1, ranging from 26–48% of trials for each indication. Phase III was the second most frequent phase, making up 54% of hepatitis C trials. Phase I made up the highest percentage in solid tumour trials.